Interface’s sustainability model shows that even large industrial businesses can reduce their carbon footprint significantly using innovative solutions such as recycling abandoned fishnets without compromising profitability. Business leaders who claim profit and sustainability don’t go together may have to think again as carpet giant Interface have proven otherwise as it reaches major sustainability milestones. The world’s largest tile manufacturer and sustainable business pioneer has as of January this year in one of its European facilities been operating with 100% renewable energy (both electricity and gas). It has used next to no water in its manufacturing processes and has attained zero waste to landfill in its European facilities in Scherpenzeel, Holland. The energy at the factory is produced by green gas created by anaerobic digestion of fish waste, which is filtered to natural gas and pumped into the grid. Another new initiative is a new water recirculation system through closed loop piping. These are key achievements for the company as they strive towards what they call “Mission Zero” – an attempt by their founder and chairman, Ray Anderson, to eliminate any negative impact the company has on the environment by 2020. The Mission Zero journey started back in 1996, by 2013 they had reduced its greenhouse gas emissions by 80% and water use by 87%. The Scherpenzeel facilities are the company’s greenest. Globally, since the start of Mission Zero, the company has reduced overall energy usage per unit of production 39%, and non-renewable use per unit of production is down 61%. Today, 36% of the company’s energy comes from renewables. Although renewables have played an important part, perhaps the most significant of measures taken are within water usage and waste management: water intake per unit of production is down 81% since 1996. Waste sent to landfill per unit of production is down 91%. The company’s manufacturing facility in Scherpenzeel, Holland has been the most successful in reaching sustainability targets. Interface has another facility in Craigavon, Northern Ireland. Ramon Arratia, Sustainability Director at Interface, says achieving the same success is harder in the UK because of a lack of Government subsidies for renewables, and biogas in particular. He says this creates problems for companies wanting to adopt sustainability measures and he calls on the UK Government to provide more subsidies for anaerobic digestion, a method through which microorganisms break down biodegradable material used to manage waste and to produce biogas. “I think the UK have been doing well in terms of getting efficiency, helping small businesses, helping technologies to spread out, but the UK has been slow in betting for renewable energy”, he adds. A new report by LaveryPennell, a strategy advisor helping clients to increase profits while improving sustainability performance, shows that adopting measures like Interface’s, companies will increase profit as well as hitting sustainability targets. The study, which was commissioned by Interface, has by using figures from them and other companies, developed a new business model: ‘The New Industrial Model’. The report shows that the “new, more profitable and sustainable business model” will bring increased profits, more jobs and reduced environmental impact using – in a nutshell – the following three stages: non-labour resource efficiency to reduce costs and environmental impacts; reinvesting some of the savings from stage one in sustainable inputs such as renewable energy and recycled materials; developing innovative new products and capturing market share growth, capitalising on the competitive advantages created in the first two stages. According to the report, other leading companies including Unilever, Body Shop, Patagonia, and Ecover have all recognised the power of implementing the model. Greg Lavery, CEO, Lavery Pennell, says their aim is to show the world that “this is a business case that is actually doable”. But why are some companies still reluctant to adopt a green approach? According to Colin Le Duc, founder of Generation Investment Management LLP (GIM), an investment management firm with a focus on sustainability, investors and shareholders hold companies back. Consequently, he says the business case is complex and while no one can argue against the model, “investors are worried about long term investment and returns” and the challenge lies in gaining credibility and getting them on board. In the case of Interface, green practices have paid off. At the same time, they have remained successful in a highly competitive industry. The company has reduced its costs by 7.6 million euros annually, and simultaneously reduced lifecycle greenhouse gas emissions by 35,500 tCO2e per year in its European manufacturing operations. Reducing costs was achieved by cutting back on energy and yarn usage, switching to renewable energy, and replacing 49 per cent of its raw materials with bio-based or recycled alternatives. A green business approach can also raise a company’s profile. Interface has won numerous industry awards including Business Green Company of the Year in 2011, Guardian Sustainable Business Award for Waste & Recycling in 2011, and The Environment Agency Sustainable Pioneer Awards 2010. Innovation has been the driving force throughout Interface’s journey. Thinking outside the box, or perhaps re-thinking the box altogether, is what’s needed to reach unimaginable goals says Arratia. And there is proof of innovation for sure. Some of the things that were considered impossible twenty years ago have now become reality. Sourcing raw materials is the cause of most of the negative environmental impact today and there is a lot of room for improvement there still. At interface, it’s the yarn, which is made of nylon. The inventors of nylon, which is synthesised from carbon, told Interface in the 90s that it was impossible to recycle. Today, the majority of their carpet tiles contain recycled yarn and some of them are made by 100% recycled nylon. The goal for 2020 is to use only recycled or bio-based materials. One of their projects for sourcing sustainable raw materials entails recycling nylon fishnets. 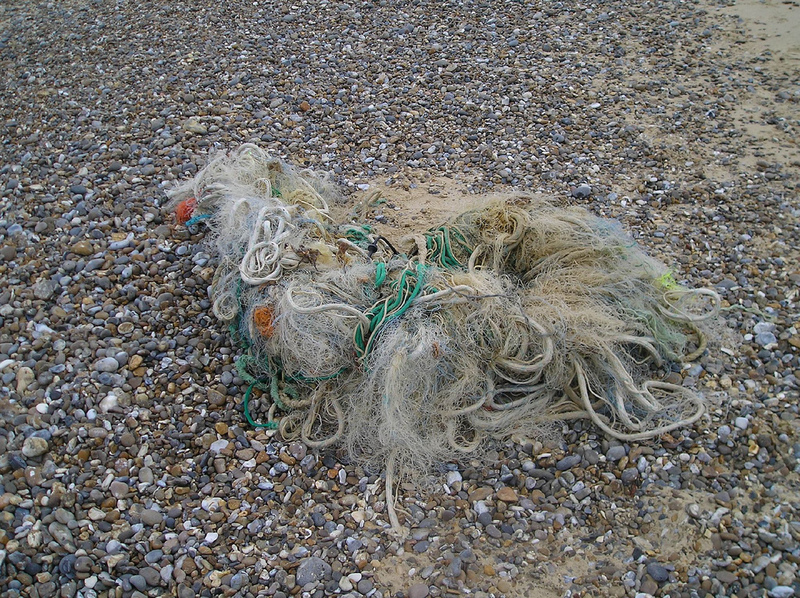 By working with the Zoological Society of London (ZSL), they source abandoned nets which are causing problems for the marine environment. The nets are collected by Project Seahorse Foundation, a coral reef conservation project in the Philippines, which works with the local communities, and are then shipped over to their factory and recycled into yarn. But even companies like Interface can do much more. They have recently introduced new innovations with the aim of reaching even further, resulting in a 95% water reduction and 90% carbon reduction from January 2014 across the facilities.